A ‘Sundowner’ is an essential safari tradition performed at the end of the day on a Kenya Safari Tour. 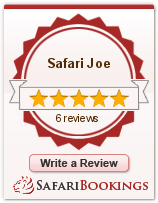 It will probably be one of the most memorable and enchanting parts of your Safari in Kenya with Safari Joe. As long as the sun sets, there will be a Safari Sundowner! On a recent Kenya Safari we woke up before the sun rose and crept out of our tents and headed straight for the safari vehicle, tiptoeing so as not to awake everyone. Just as we departed the first light of day could be seen peeking over the horizon of the Indian Ocean in Watamu. The early morning was cool and it was good to be travelling at this time of the day, escaping the searing heat. The chorus of birds could just be heard as we arrived at the entrance of the Arabuko Sokoke National Park along the north coast of Kenya. We entered into the Kenya Wildlife Service office and paid our entrance fees and collected our guide for the morning. For the first part of the tour we set off on foot to the wooded area close to the park entrance. Here we had a good look at a Golden-Rumped Elephant Shrew which is indigenous to this park. Although the shrew was very shy and quickly disappeared once it sensed us we still managed to get a really good view. I often think about what strikes me most about Africa and I think it is the vibrant colours. Whilst a lot of places in the world live in monochrome, the continent of Africa is seen in Technicolor! From the moment that you land on the continent on your Kenyan Holiday, your eyes are in for a feast, the colours are truly magnificent. From the rich ochre of the fertile earth, the vibrant tropical green of the banana plantations to the deep blue of the endless skies overhead, there is never a dull moment for your eyes. The stunning ebony skinned beauty of the people that walk the continent and the warm golden colour of their cattle. The dazzle of the hot sunshine glitters like a million jewels bestowed upon the luscious green grass. Africa is blessed and cursed by the hot sun; whilst it gives life to the continent it also drains the very same life, still that very same sun beats down on the land and fills it with every colour imaginable, even with the rains there are rainbows bowing down to kiss the earth. Equatorial Africa has two very unique seasons, namely the ‘wet’ season, also called the rains and the dry season. The dry season, a period where it is generally hot and dry, runs for the most part of the year, broken up by the short rains and the long rains. The rainy season doesn’t just appear overnight, it builds up for days, even weeks, the parched earth thirsty and craving water to bring it back to life. Slowly clouds begin to gather on the horizon, big burly white clouds, boisterous and turning a shade of purplish grey as they accumulate, the air charged with excitement. The cicadas begin their frenzy, their shrill racket all around as the electricity builds. This is a great time to be on safari in Kenya, a time where new life is just about to begin, the animals giving birth to their young, the grass ready to crack through the dry crust of the earth and the rivers preparing to flow once more. You can smell the first drop of rain as it comes, a cool refreshing scent, all at once the winds pick up and the heavens open, the much awaited rains have arrived and you have witnessed this spectacular event, the immense energy of mother nature touching the earth and breathing new life into its soul. To be witness is unforgettable, the colours, the sounds, the smell, the feel, you can even taste the rain; your every sense is awakened as only nature can do. African nights in the bush are usually pitch black, just the moon and stars overhead, but what can be more romantic than a candle lit dinner, under the stars? Your table gently illuminated by a flickering candle, the yellow light softly creating the perfect ambience. Around the camp there are lanterns to light the way, placed along the paths or hung from the branches of a tree, adding a warm glow, creating shadows and shapes that flicker as the flame jumps around inside the glass. Yet perhaps the most spectacular light comes from something else more exquisite. As your eyes become accustomed to the flashes of yellow and green you realise you are surrounded by hundreds, even thousands, of tiny fire flies, their light twinkling like the lights on a Christmas tree. This is a sight that you will hold in your heart for a lifetime, these tiny flies creating this fascinating show in the middle of the wild African bush, pure, natural and magical, better than anything you have ever witnessed before, a natural phenomenon displayed just for you to enjoy on this perfect evening of your Kenyan Safari. What is it like to go on a Safari in East Africa? It is an unforgettable experience. Why? Because it is Magical! I will never forget the excitement of seeing our first zebras, impalas and giraffes, and we had not yet even reached the gates to the park, already we had taken so many photos. After entering into the National Park it wasn’t long before the unmistakable shape of an elephant appeared, and another, and another and before we knew it we were alongside a whole herd of these noble creatures. Our afternoon just got better and better, a pride of lions tucked beneath a kopje of rocks, their golden coats camouflaged so well amongst the tall yellow grasses, just the playful cubs visible pouncing on each other, carefully watched over by the lioness. After a hot and dusty game drive, we were taken to one of the most heavenly spots to observe the sun going down. No safari is complete without ‘Sundowners’, a unique tradition performed at the end of the day. We watched as a giant orange ball disappeared over the dusty horizon, the colours of the earth dramatically changing as the evening quickly began to close in. To compliment this special moment we had drinks from the cool box, some wine and beers to toast the end of the amazing day, accompanied by some ‘bush bitings’ of nuts, tortilla crisps with guacamole, cheese and crackers and cocktail sausages, all served on the bonnet of our safari vehicle. Given that Dawa is Swahili for "medicine" or “magic potion” this famous cocktail is said to be so potent that it will cure whatever ails you. The fact that it's the most popular cocktail in Kenya just might support this claim. The recipe is based on a famous Brazilian drink that was introduced to Kenya. It is now one of the most widely consumed cocktails in Kenya and has spread through out North and South Africa (especially in touristy regions). Enjoy!!!!! 1) Put lime and sugar into a whisky tumbler. 2) Crush limes slightly, add ice and pour in the vodka. The Infamous Long Drop Loo ~ Tips n Tales from an East African Safari Holiday! There may be one time on an East African Safari Holiday that a long drop loo may be your only option because, let’s face it, when you’ve gotta go, you’ve gotta go! It is used daily by millions throughout Africa that’s why we thought it only pertinent to share with you some of our expert knowledge of this “special” place. In fact I think we fall under the category of pro’s! Maize is one of the basic staple foods eaten across the entire continent of Africa! You will pass huge plantations everywhere on your travels. Large green stems taller than a person occupying any available piece of earth. Once it was picked, it was traditionally stored in a huge elevated grain store, or granary. Maize can be cooked on the cob in many different ways, including being steamed, roasted or boiled. To produce the maize flour, firstly remove the kernels from the cob and dry them; then they are sent to the ‘posho’ mill to have the outer husks removed and then finally to be ground into flour. Maize flour is consumed on a daily basis in most households; for breakfast it is boiled into a runny porridge and drank from a gourd or calabash, the flour is sometimes mixed with other flours such as millet, sorghum or amaranth. A Coconut Trees Many Uses! Did you know that a coconut tree has many uses; there is not one part of this tree that is discarded! - Firstly, it produces coconuts; the milk and flesh are edible and used to flavour many dishes throughout the world. Dried coconut meat, called copra, is made from the mature coconut. The copra is pressed in a mill to make coconut oil and coconut meal, used in animal feeds. The edible oil is used in hair and skin care products, soap and sunscreen. - The leaves themselves have many uses, they are woven to produce baskets, hats, mats and fish traps. Leaves are also prepared into a roof tile and used to thatch an entire house, an excellent and watertight creation. - The coconut husk has long fibres which are used to make rope, nets and doormats. Pieces of husk can be used as scrubbers to clean floors and cooking pots or for kindling for the fire. What can you find in your local Duka in Africa? What a cool experience to go to the supermarket in East Africa and find a Masai warrior, in full attire queued up beside you, usually buying a bag of sugar or some milk, this happens often, especially in towns where there is a big Masai population! Most locals however, don’t use the big supermarkets, usually preferring to buy from their local ‘Duka’ or ‘Kibanda’ which is a tiny shop often found everywhere even the most remote villages. There are many of these little shops, constructed either from bricks, corrugated iron, wood or even grass thatch. Inside you will find someone selling everything that you may possibly need. They sell fresh produce straight from the garden, whatever is in season: bananas, mangoes, oranges, tomatoes, coriander, onions, spinach and cabbage. A good way to recognise one of these little shops is they often have a large poster advertising mobile phone credit of some type stuck on the outside. Inside is an Aladdin’s Cave of merchandise. Go on you know you want to eat Bugs! I can hear you already saying no way! Go on, give them a try, you might be pleasantly suprised!!! The first time I ever ate bugs was in Zimbabwe, quite a few years ago where Mopane Worms (caterpillars) were on the menu. These worms or caterpillars having been collected by hand were degutted, boiled in salted water and sun-dried, then fried and served in a small bowl. They were quite chewy and hard but too salty and gritty for my liking. I must say I did try them more than once to give them the benefit of the doubt, definitely not my cup of tea! Put the Kettle on for a Cuppa! Tea in Africa is an occasion. It is a meal. It is a social event, a huge part of daily life consumed across the continent. It is known locally as Chai. It’s not prepared the western way by dunking a tea bag in a mug of boiling water and then pouring in some cold milk. It is cooked! Tea leaves are boiled in a saucepan with some water, once it has bubbled for a while, about the same amount of milk is added as it continues to boil. A little sugar is added and maybe some ginger, masala or cardamom. Cook a little longer and then remove from the heat, strain through a sieve into a giant flask and quickly close to keep the temperature near boiling. Why Adventure Camping is Fun! Bugz n all! A holiday to East Africa is a journey to another world, a world to be embraced with a sense of adventure and a willingness to enjoy the ride; pot holes, bumps, mud, dust and all. Once you have left your ‘creature comforts’ behind and spent a few nights in the wilderness, it will seem quite normal to sit around the camp fire in the evening, sleep under canvas, use a traditional ‘bucket’ shower and perhaps even wear the same ‘dusty’ safari trousers two or three days in a row! It is a really fun experience; especially if you are down to earth then you will really love this grass roots type of travel. Safaris in East Africa are always an adventure; remember to pack a sense of humour and a sense of wonder, you will need them both. Camping safaris are 'hands on', putting up your own tent, helping with the cooking and cleaning up is all part of the experience. Camping is really one of the world’s greatest travel adventures. Pitching your tent in the bush gives you the feeling of really living in the wild. The campsites can be quite basic, adding to the authenticity. The romance of an open campfire under a magnificent sky full of stars is undeniable and a night in the wild beholds a magical experience. During the night you have a Masai guard who sits around the camp fire whilst you are asleep, keeping the embers going to scare away any wildlife that may come too close. Visit Kaya Kinondo Sacred Forest with Safari Joe. Located near to Diani Beach along the Indian Ocean, south coast of Kenya. A 'Kaya' is a pocket of sacred forest that owes its existence directly to the cultural beliefs and history of the nine Coastal Mijikenda ethnic groups or tribes. Kaya Kinondo is the senior most Kaya (home) for the Digo people located in Kwale District, Coast Province. It is just a few metres from the pristine Indian Ocean shoreline and close to the world famous Diani Beach, an internationally recognised tourist destination. Kaya Kinondo is well represented in biodiversity and still bears the marks of prolonged human settlement in the distant past within the forest, that adds credibility to the rich folklore associated with the site. Kaya Kinondo was the first Mijikenda sacred forest to open up for controlled ecotourism. When you visit this site it is important to show respect for the forest and people, upon arrival you will be given a short brief on how to behave on the visit. The stunning Shimba Hills National Reserve is an ideal day trip for those staying in Mombasa or the South Coast of Kenya, as it is less than an hour drive away. The reserve contains one of the largest coastal forests in East Africa and is where a great diversity of Kenya’s plant species are found, many of which are endangered, explore this and more on a One Day Shimba Hills Safari. Peanuts, known locally as groundnuts are an important crop in Uganda. As well as providing a source of income they also play an important role socially. Ugandans are being encouraged to grow this crop to empower them into becoming productive citizens, who are able to take care of themselves and their families. Women will serve them to their guests as a welcome snack, as well as sharing news whilst sorting the legume. The raw groundnut is also boiled or steamed in the shell and eaten whole, or, alternatively roasted and ground into a fine powder which is then used in many different recipes. Groundnuts that have been cooked into a thick pink paste often accompany Matoke (cooked green bananas), rice and spinach or bamboo shoots. Totally delicious! Kitesurfing is becoming extremely popular as an adrenalin activity. Kitesurfing in East Africa is huge, especially here in Kenya at Diani Beach. This growing extreme sport is very popular along the coastline of Kenya and Tanzania. People are able to incorporate a kite-surfing course into their Kenya Safari, or visit purely to Kitesurf, a Kite Surfari! Come as a complete novice and take a course to learn this adrenalin pumping sport, or, come as a proficient kite-surfer and enjoy the constant winds and protected beaches that East Africa has to offer. It is a pure thrill as a huge gust of wind inflates your kite and you are propelled across the warm Indian Ocean skimming the waves on your surfboard. The spray splashes past as you reach crazy speeds and it takes all your energy, balance and skill to maneuver your kite to make a turn and head back to the shore. From the shore even to watch this sport is adrenalin pumping; brightly coloured kites flying high in the clear blue sky is a sight to behold, watching the surfers doing stunts and taking off is a real spectator sport. Lake Nakuru is one of Kenya's premier National Parks and world renowned. It is perfectly situated within a couple of hours drive from Kenya’s thriving capital city, Nairobi. A relatively small national park with a lot to offer, Lake Nakuru has the largest concentration of both Black Rhino and White Rhino in the country. As soon as you enter the park you are immediately treated to breathtaking views and an abundance of wildlife. Gigantic yellow barked acacia trees surround the lake and pockets of euphorbia trees are scattered within the park. The soda lake in the middle attracts at times hundreds of thousands of flamingos, giving the lake the appearance of a pink fringe. Once spooked the flamingos all take off together and a huge cloud of pink swarms the lake until they settle down again. It is possible to drive down to the water’s edge and sit and watch this spectacular bird show. The park has a high density population of Leopards and although rare it is often possible to spot one, resting in a tree to avoid the heat of the day; the tell-tale sign of their tale hanging down from the branches, alerts you to their presence. Ziwa Rhino Sanctuary is the very proud home of the only rhinos presently found in Uganda. At the moment there are about 15 white rhinos on the sanctuary, including the new addition born last April, a calf called Luna to rhino mum Bella. This successful venture has seen many calves being born there and offers hope of eventually reintroducing rhinos back into the wild in Ugandan National Parks. The sanctuary is under constant 24 hour surveillance and the rangers do a magnificent job of protecting these pre-historic creatures. With Safari Joe you can visit Ziwa and go on a 'Rhino Encounter' where you will walk as a small group with a trained ranger to look for rhinos. Once you have found the rhinos you will have a chance to observe them at a very close yet safe distance. Due to quite poor eyesight, a rhino will allow you to get reasonably close without being too worried. Explore the South West of Uganda, the area around Lake Bunyonyi, Kisoro and the Virunga Mountains that separate Uganda, Rwanda and the Congo. Here you will see some of the most stunning, spectacular scenery on the planet. Visit and you will be instantly enchanted by the magic and serenity that this friendly country has to offer. One of these magical places is Lake Bunyonyi, situated in the south western region of the country, the name translates to “Place of Many little Birds” and it truly is an ornithologist’s paradise. Lake Bunyonyi is so vast that it has 29 islands in its midst, one of these islands is called Punishment Island and history has it that unmarried girls were sent there if they became pregnant! Look out ladies!! The Annual Camel Derby in Maralal is an epic Kenyan event, the ultimate race of skill and endurance with a Camel, enjoy our blog! When you go on a Kenya Safari, it is not just about the endless savannah, or the kilometres of pristine beaches that fringe the coastline. It is also about the unique cultures and events that the country offers, some quite balmy. One of those events is the Annual Camel Derby in the Maralal area, a remote desert outpost in Samburu County. This event has put this sleepy little town on the world map. For the other 360 days of the year it is back to being a sleepy little Samburu town, but for a few days of the year during the month of August, locals and tourists gather from all over the world to watch or take part in a unique event, the Camel Derby. Camels are common up in the Northern Frontier District of Kenya; alternatively known as ‘Ships of the Desert’ these ungainly beasts can go days without water in the hot and dry conditions of the world’s driest regions. The World Famous Masai Mara is an Award Winning National Reserve in the heart of Kenya, famed for its abundance of wildlife and rich culture. The Masai Mara is a National Reserve as the Masai people live alongside the wildlife and are permitted to graze their livestock within the reserve. An unforgettable sight is the Masai dressed in their red 'shuka' or blanket, trailing behind huge herds of cattle, the dust lingering in the air as they turn and head off into the sunset. The Masai Mara is undoubtedly one of the most fascinating destinations in the world, endless grass plains teeming with wildlife, encircled by towering mountains and rock kopjes all make for some very exciting game drives. This park is adjoined in the south to the Serengeti in neighbouring Tanzania and together they make up part of a very diverse ecosystem. The Diani Beach Annual Goat Derby in Kenya is a yearly event all in the name of charity! On one day a year a bunch of crazy locals get together and race goats. This place is in Kenya in the small coastal town of Diani. If you visit around October you too could be a part of this unique local event and it’s all in the name of charity, raising money for many local projects and organisations. In Kenya there are not so many racehorses but there are many goats, therefore it is only apt that the races are participated in by goats and not horses. It is a very light hearted event that attracts locals, expatriates and tourists alike to come and enjoy an afternoon in the hot sun; and be entertained by some of the most elite athletes in the country, a herd of very agile goats. As well as the Goat Derby, there is a plenty for the kids to do including: face painting, bouncy castle and a fancy dress competition. As you traverse the rugged terrain of the Masai Mara in East Africa on a Kenya Safari Holiday or a Tanzania Safari Holiday you may perchance have the luck of meeting a Masai Warrior! The Masai are famous for thier Masai Sandals, enjoy our blog and discover why! The Masai are extremely amazing people who typically live around the southern areas of Kenya and northern region of Tanzania, in fact they know no borders, carry no passports and freely cross between the two countries as they have done since time immemorial. As well as wearing the red blanket or 'shuka' and the colourful beads there is something else that sets their unique appearance apart! Now, if you look down at their feet you will find the most astonishing pair of shoes you have ever seen! But you have to be there to see it and believe it!!!!!!!!!!!! Every year since 1989 the Rhino Charge Kenya is one of the most exciting Annual Off-Road 4x4 Motorsport Competitions. This extreme 4WD challenge is a fabulous, action packed event. Plan your Kenya Safari to coincide with this unmissable occasion. The event is scheduled annually around the last weekend in May, first weekend of June. The name ‘Rhino Charge’ is not what the event is really about, the actual event is an off road 4x4 challenge! The aim of the challenge is to negotiate a set course in as short a distance as possible. This ends up in some very tricky driving skills over incredible terrain. The Rhino Charge Kenya is a fund raising event to raise money to build a fence around the Aberdare National Park to protect the Rhinos.